The biggest lie that Tumblr ever told me was that an androgynous body is a thin body. As a genderqueer person, someone who doesn’t strictly identify as a man or a woman, I had always craved a more “androgynous body.” I wanted to be a mish-mash of masculinity and femininity, so that when people looked at me, they could not immediately categorize me. And so I clung to the beautiful photo sets on Tumblr, the ones with impeccably genderless bodies… which all just so happened to be thin. I spent too long worrying about whether or not my body fit the criteria, obsessing over whether or not I was “androgynous enough.” I spiraled in and out of disordered eating, thinking that it was my body that was making me unhappy. Spoiler alert: It wasn’t my body that was making me unhappy. It was the norms and expectations that taught me that I could only be valid in my identity if I looked a certain way. It was the norms and expectations that taught me that I was “less” of myself the more that I weighed. Here’s the thing: androgynous bodies come in every shape, and in every size. Because the only criterion for an androgynous body is that the person inside that body identifies themselves that way. You do not need to look any specific way to be who you are. You are queer, you are here, and no number on a scale makes you more or less of who you are. Just like there is no right or wrong way to be a man or be a woman, there is no right or wrong way to be androgynous. I take up space, and I have curves, and yes, I have stretch marks – a lot of them, in fact. My body looks nothing like the photo sets I used to fawn over on social media. And yet none of these things negates the fact that I am genderqueer. To me, being androgynous is all about having the freedom to express and pursue gender however you see fit. And that’s something all of us can do, no matter what our size is. I want to extend love and affirmation in particular to those queer folks who felt that their bodies were not “enough” if they dared to be fat, dared to be curvy, dared to exist exactly as they are. Your body is enough. You do not need to look any particular way to be valid in your identity. You are valid exactly as you are. 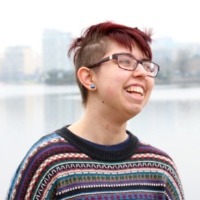 Sam Dylan Finch is a queer activist and feminist writer, based in the SF Bay. He is the founder of Let’s Queer Things Up!, his blog and labor of love. With a passion for impacting change through personal narrative, Sam writes about his struggles and triumphs as genderqueer and bipolar with the hopes of teaching others about his identity and community. When he isn’t writing, he’s probably eating takeout and dancing to Taylor Swift. Connect with SDF: Website ; Facebook ; Twitter ; Tumblr.